TLE is in Seaside, OR.....as the name suggests, on the coast of Oregon, just south of Astoria. She is enjoying cool temps in the 50's......here it is mid 80's with high humidity....please, I can hear you whispering.....I know when I use the term "high humidity" it's relative to what I have lived most of my life enjoying. Most of my life was lived in the desert that is called Southern California, the humidity hovers around 44%.....comfortable. When it gets above 80% it gets "uncomfortable".....for me, and it has been well above 80% these past few days here at the IMS. I was up Thursday by 7 am, wrote the blog and then headed outside to wash some more of the coach before the sun got too high in the sky, and the aforementioned humidity became uncomfortable. I was able to get the back of the coach, and half way up the driver's side before it started getting sticky. I slipped back into the air controlled environment of the coach to cool down. While that was happening I made a bowl of dry cereal, got dressed, and headed back to 38th Street to check out some of the thrift stores I had seen the day before. I thought the Salvation Army Thrift Store was the best of the two I visited......amazing selection of pre-owned clothing, and I almost pulled the trigger on a few items, but in the end decided I could live without them.....and this was their 50% off day. I also had seen a Peddler's Mall down near the Interstate so I checked that out too, and was totally disappointed....it was nothing like the one in Campbellsville, KY that we frequented often while we were there working at Amazon.com. I spent about 5 minutes inside, and headed for the door. Next up was lunch at White Castle's. Some may find this hard to believe, but I have never had a slider at White Castle's before, let alone eaten there. I've been told over and over again since we have been here in Indianapolis that I must go there at least once. I ordered the #1 Combo....4 sliders, fries, and a Mr. Pibb. Quite frankly I was pleasantly surprised at how tasty they were. I'm not really a fast food kind of guy.....I may have a Western Bacon Cheeseburger at Carl's Jr./Hardees a few times a year, but generally we are looking for something unique when we visit a new area, and, after all, how many fast food places have had a move made about them (Harold and Kumar go to White Castle)....I guess that may qualify them as unique. I stopped off at Kroger's to pick up some milk, and a few other beer staples then headed home arriving about 2 pm.....by this time the driver's side of the coach was in the shade again, so I finished both the driver's side up to the front cap, and then finished the passenger side up to the front cap....only the front cap left to do, and I think I'll do that when I return from Michigan next week. I spent the rest of the afternoon enjoying the effectiveness of my air conditioning, napping, and watching a little PGA Golf. Later in the evening I watched a couple of recorded TV programs, then watched the first half of the Pacers/Heat game.......early in the 3rd quarter the Heat began to pull away, and, as I found out this morning, they won by 11.....now back to Indianapolis for game 6. I was in bed a little after 10, but woke up in a sweat around 2:30 am......I looked at the temperature and it read 86! Wow, time for some A/C....so I got up and turned on the front A/C and then went back to sleep. It's about 6:30 am on Friday, and it has started raining....the forecast locally is 60% chance of thunder showers throughout the morning, so it looks like I may have the top up for the first part of my drive up north to Michigan. One interesting side note.....a few months ago while we were still in Cedar Key Chris and Cherie of Technomadia fame interviewed us for their video series "Ramblings: Tales from Nomads". We were notified by them a few days ago that they had finished editing the video and it was going live on their website. Well it did, and now FMCA (Family Motor Coach Association) has picked up the video and has included it on their site, too. You can click on the "Ramblings" link, or the FMCA link to watch the interview. We were very pleased with it, and I hope you will be, also. I dropped TLE off at the Indianapolis Int'l Airport around 5:30 am and then retraced my steps back to Georgetown Court which has been our home address since May 6th. Thus starts my "Bachelor For A Week" time. This is the first time Elaine and I have been apart overnight for almost 16 months on the road. I made some dry cereal for breakfast and finished my coffee, then got dressed to go out to Home Depot and Autozone for a few things. I was going to wash the coach, but it was very, very, very humid......did I say it was humid? I decided that I would sit in the shade and polish the aluminum wheels instead, and hope for a more hospital environment Thursday to wash the coach. 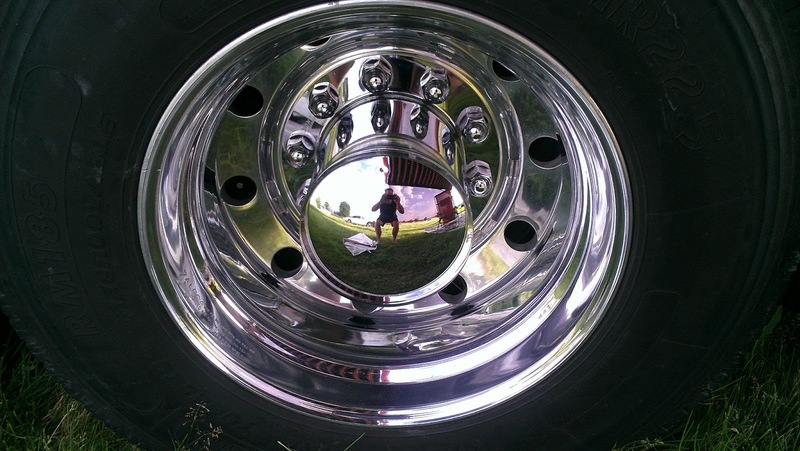 The rear wheels are very hard to work on.....I always feel like I'm standing on my head to get to every nook and cranny of those wheels. On the other hand, the front wheels are very easy to do and take about one tenth the time. I think they turned out quite well! On my way back from Autozone I noticed a Peddler's Mall, and several large thrift stores on 38th Street. 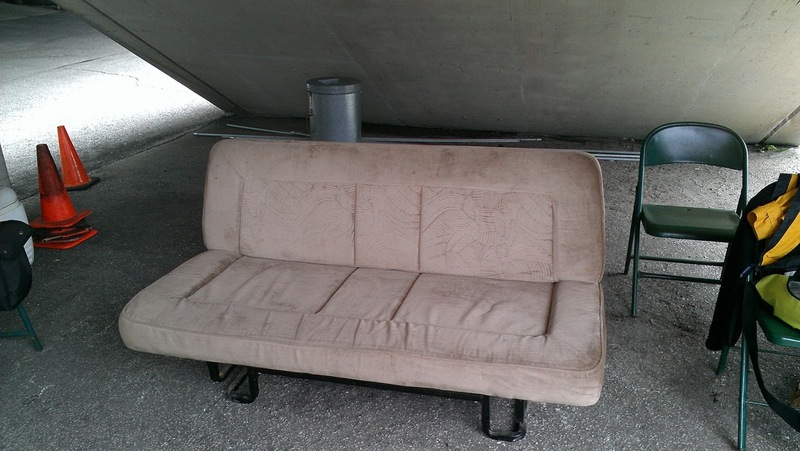 I think after I wash the coach on Thursday I'll check them out. I reorganized some things in the trailer, took a few naps.....still catching up, and before I knew it 5 pm had rolled around. I ended up getting the two wheels on the passenger side done. There were a couple of conversations with insurance customers, talked with Krash and Karen about my impending visit, talked with my oldest son, Chris, who forwards my mail when we have an address, and finally my oldest daughter, Meredith. Around 8 pm TLE called.....she arrived safely in Portland at 11 am Pacific Time, which is 2 pm my time.....about 7 hours of travel time. I watched a few recorded shows, and was in bed by 10.....not a big day, but a nice day of a little work, conversation with family, and lot of relaxing.....just what I needed. I've got to get the coach done Thursday because Friday will see me heading north on I-69 to Ypsilanti, MI in the Thunderbird, probably with the top down. Again, another morning waking up to the sun. When I looked outside it was obvious someone had turned on a giant vacuum......the campground was almost empty.....there are 8, or 9 RV's left, and a couple of tents. Those who are left will be here the rest of the summer to work the Brickyard 400 and the Motorcycle GP....we'll be somewhere in Alberta, Canada by that time. Since TLE is leaving on her trip to Portland Wednesday, Tuesday was a day of preparation for her. First thing up......get the laundry done.....we haven't done a real laundry for 18 days now. While she did the laundry I drove over to a Supercuts to get my ears lowered.....I really should have gotten a haircut before we started our job, but since I was wearing a hat for 16 straight days it didn't really matter....I was going to have "hat hair" anyway. After the haircut and laundry tasks were completed we headed to Krogers to pick up a few things we didn't get at Trader Joe's Monday, and then it was home for the afternoon to relax......well not quite.....TLE did have a few projects to take care of involving her sewing machine. We have 4 sun screens in the driver/passenger area that are like pull down window shades, except they are silver on the window side to reflect the sun. Over the years the binding on the edges has begun to come loose, and it was time to just restitch them. There were a few articles of clothing that needed some attention, too. As we worked at our chores we could hear the sound of the Indy 2 seaters running around the track......due to the rain storms prior to Race Day they had gotten behind in the ride alongs. They ran all day long until 7 pm. It's kind of funny to admit, but I kind of like the sound of those Indy Car engines. Almost time to get dressed and drive TLE to the airport........thanks for stopping by! We awoke this Memorial Day with the sun already high in the sky. There were no uniforms to wear, no ID badges hanging from our necks, and no place to go. Our labor of 16 days is complete........so why are we still at IMS when most of our co-workers left shortly after they clocked out the final time Sunday? I have alluded to the reason before, but let me quickly recap our plans. Wednesday TLE (for those who have only recently joined our blog TLE stands for "The Lovely Elaine") is getting on a jet plane early Wednesday morning to fly to Portland, Oregon for her annual women's retreat. She missed it last year, and was determined to make it happen this year. Because we are in a place where I can stay for six days at no cost it makes it easier to get her there and back. I've got things to do to the coach in the next week. No, there are no maintenance issues, but she needs a little exterior "tlc"......it has been a couple of months since she was detailed, and her ALCOA rims polished, so while TLE is on her retreat I will be sweating under the Indiana sun to ready our Newell for the road, and our Newell Mini-Rally in the Black Hills of South Dakota starting June 22nd......it's just over 3 weeks away and we want to look our best when we arrive! Monday we kind of lazed around all morning just enjoying the fact that we had to be no where, and do nothing if we chose. It was not dark when we exited the coach for the first time in 16 days. Since it has been 16 days since we dumped the black tank it was time. Our plan to go 16 days without dumping worked perfectly except for one thing. You know, there is always one thing that separates us from the perfect execution of a plan. As I was hooking up the 4 hoses necessary to reach the water spigot I heard Fred, the gate security guy here in the campgroung, yell...."NO, NO, NO!" I turned around to see him waiving his arms and shaking his head in the negative. As I walked over to ask what campground faux pas I had committed I heard him saying....."there is no water".....wait, what? I just filled up my fresh tank a few days ago......Fred goes on to explain that the water meter started leaking, and then at some point a few nights ago burst causing a minor flood.....okay that explains all the water in the gravel parking lot we were dodging around a few mornings ago....I just thought it had rained, and I didn't hear it. Well, that is a sort of big problem, because one important component of dumping the black tank is filling the empty black tank several times with clean water and flushing out any remaining effluent. This prevents future unpleasant odors, which to date we have never had a problem with ever. So I'm standing there wondering what we are going to do....are we going to have to put the awnings in, disconnect from the electrical pedestal and drive somewhere to dump our tanks. Suddenly it occurs to me that we have accumulated about 90 gallons of gray water in the past 5, or 6 days....I need to dump that too, so why not just use the macerator pump on the gray tank to pump that "cleaner" water though the black tank and then flush it into the sewer system with the portable macerator pump. To make a short story shorter......it worked like a charm.....certainly not ideal, but a good short term solution. As for fresh water, we still have 100 gallons left, so no worries there. TLE will be gone for almost a week, and on Friday I am driving the 'Bird up to Michigan to see Krash and Karen, and then my sister Jill, so we won't be using a lot of fresh water in the next 10 days. Another thing I wanted to do.....I didn't need to do it, but I really WANTED to do....was borrow my neighbor's weed whacker and cut down the tall grass that has grown up around our coach and trailer in the last 21 days. Nate gladly retrieved the "whacker" for my use, and within 30 minutes the tall grass was laid waste. By this time is was after 2 pm, and time for a nap.....even though I got 11+ hours of sleep Sunday night I am still tired. Around 3 we started to get dressed to drive up to the north side of Indianapolis to a place called Lebanon to visit our new friends Jeanne and Chris. You will recall (Traffic Control - 4th Day) they came to visit us on the 4th day of our 16 day gig. Jeanne has been following our blog for a few months and wanted to meet us when we got into town, and see our Newell. Jeanne and Chris recently purchased their 1989 Prevost 40' motorcoach, and we wanted to drive up and see their coach, and spend some more time with them. They will be embarking on their fulltime journey in a couple of days. They have sold their home, and as of Monday, and, just after we left them, they finally sold one of their remaining two vehicles, so they are set to go. We had a nice visit and are really looking forward to reconnecting with them in a few months on the road somewhere in the west. Happy travels Jeanne and Chris! It had started to rain just as we arrived at Jeanne and Chris' coach, and continued to drizzle on and off as we drove over to Trader Joe's to do some much needed shopping. Right next to Trader Joe's is a micro brewery called Rock Bottom Restaurant and Brewery where we decided to have dinner before shopping. As we sipped a couple of their Porter's we continued reminiscing about the prior 16 days and how the time we spend working, while long hours are involved, makes getting back on the road even sweeter. We've spent 16 days working, and now will spend over 4 months travelling again before we spend a few more weeks working the sugar beet harvest in Shelby, MT. After a delightful dinner we exited the micro brewery to find a torrential downpour. Since TLE was driving and didn't want me to have to adjust the seat just to bring the car over she volunteered to retrieve the car and let me stay dry.......what a woman, huh? Moved ourselves and the car a few hundred feet over to Trader Joe's and did our resupply of wine, beer, cheese, eggs, etc. and were on our way home within 30 minutes. As we moved south the rain stopped, but just as we were parking the car the front caught up with us and dumped some more moisture on our campground. Around 9 TLE went back to the bedroom to read, and, apparently, I fell asleep watching American Pickers....I suddenly awoke around 10, and went to bed.......it's going to take a few nights of sleep to recover from the mild sleep deprivation we put ourselves through the past 16 days. No worries, though....there are lots of naps in our future. That was Memorial Day for us.......of course we are so grateful for those who choose to serve their country whether it be the Army, Navy, Marines, or Airforce. My father, Arthur Ray Hockwald, served in the Navy during WW2 in the Pacific as a machinist servicing and repairing PBY Catalina reconnaissance air boats. We owe a great debt of gratitude to those who serve, have served, and especially to those who have given the ultimate sacrifice that we might have liberty......the liberty that enables TLE and I to live this wonderful life we have. A year ago at this same time we were in Coeur d'Alene, ID visiting our college friends George and Brenda. Can't believe it has been a year....seems just a few months ago. IMS - Day # 21 - Traffic Control - 16th Day - "Gentlemen Start Your Engines"
First of all, I am NOT, and never have been, a "Race" fan. I have never watched one car race from beginning to end.....maybe a few minutes here and there on Sportscenter. You know how there are just some movies you know you must see on the "big screen", well this is one event you must see in person to appreciate.....and I mean that in the most sincere way possible.....I'm not saying this because I just spent 16 days working here at the Indianapolis Motor Speedway. Frankly, all 16 days we were here each of my co-workers was encouraging TLE and I to make sure and watch the start of the race, and I politely replied "okay" to each conversation never intending to do so. Of course, once again, I get ahead of myself. Our start time Sunday, May 26th, was 3:15 am. I woke up around 1 am, and just decided to get up.....I had gone to bed at 8 pm, so that was only 5 hours of sleep.....just slightly down from the 6 I've been getting. As we made the long walk over to "Check In" for the last time we talked about the great time we've had here. Sure the hours were long, but we made some wonderful friends.....not hard when you spend 12 hours a day for 16 days with someone.....you'll either hate them, or love them after 16 days. To name a few of our new friends.....Lynnis, Rick, Deb, Joe, Greg, Phyllis, Eddie, Sarah, Walt, Dan. All hardworking, loyal, dedicated people. As Louis L'Amour, my favorite western author, would say......"people to ride the river with". I've written often how at the end of the day we have seen a lot of cool things in almost 16 months, but it is the people we have met along the way that will remain long in our thoughts and memories after all is said and done. Anyway, we clocked in, and immediately caught a van up to Gate # 2, where we arrived at 3:10 am. Already there was a lot of activity at the gate.....we were turning away spectators who were trying to get a jump on the day 2 hours before the gates opened at 5:30 am. When the gates did open it was immediately chaos. On Race Day you must have a ticket for each person entering, plus, if you are driving your car into the infield, you must have a parking sticker affixed to the inside of your windshield. There are 3 lanes going east, and 3 lanes going west on 16th Street. Lanes 2, and 3 on the west bound side were entering Gate # 2, so two of us had to begin walking down the street in between the cars in these two lanes to "weed out" those who had no parking sticker. This is the first year they have charged for parking on the infield. In past years you only had to by an admission ticket to drive inside and park, so it was effectively first come first served. This year you had to buy reserved parking at $25 per car in advance......that is quite a revenue enhancement. As you might imagine those who were counting on free parking inside were "slightly" disappointed after waiting in line for an hour only to find out they couldn't get inside......just use your imagination. I was on the line, except for 2 bathroom breaks, from 3:30 am until 11:45 am, walking up and down 16th street getting those without parking stickers out of the entry lanes, plus answering a few thousand questions about "what, where, when, and how". Most people were pretty easy going, but in a crowd of a few 100,000 you're going to find a few cranky people. At 11:45.....just about 30 minutes from the start of the race, our co-workers insisted we stop working and go up the ramp to see the opening ceremonies, and the start of the race. Gate # 2 is located on the south side of the track between turns 1 and 2, so where we stood was exactly in the middle of these two turns where a giant TV showed us what we couldn't see. The deeply ingrained traditions spanning over a century of racing here are maintained with an almost religious reverence. The stands were packed, and the infield was awash with a sea of humanity as far as the eye could see. We ended up watching the first 35 laps....there was a crash right in front of us on the 3rd, or 4th lap, and then things took off....Marco Andretti and Tony Kannan swapped the lead over and over again. In all there were over 71 lead changes....a record. The average speed of over 191 mph was a new record, also. There were a few more accidents, but none serious, and all were cleared quickly. We watched about 30 laps in the middle of the race, and then saw the final 45 laps. I was very exciting to watch the leaders come through from the far side of turn 1 and disappear quickly on the far side of turn two.....our attention then switching to the giant TV screen in front of us. At one point 25 cars were on the lead lap, and only separated by 9 seconds. The weather was cloudy, and in the high 60's......perfect racing conditions for the drivers and their machines. I must admit I had very low expectations, but to say they were exceeded is an understatement of serious magnitude. I'm not saying I've become an avid car racing fan, but would I come back to see the INDY 500 in person......you bet! I took this series of pictures just before we went to see the start......most of the cars were inside by now. The race ended at 2:50 pm, and the track was emptied of a few 100,00 people, and cars by 5:30 pm....amazing. The hardest part of our job after the race was keeping intoxicated people from crossing the street in front of cars exiting from the infield....there were a lot of close calls. We clocked out around 6 pm.....so 15 hours on our final day.......we arrived "home" around 6:15, got into comfortable clothes, poured ourselves a few fingers of Scotch and just sat there smiling at each other. We have had a wonderful time here. Of course, I know the question is coming....."would we do it again? ".....my answer is swift, and without reservation......"YES!" A big thanks to all our co-workers who made this experience memorable, and so much fun.......and to think we got paid! TLE just calculated that we worked 115 hours each the past 9 days. Wednesday TLE will fly out to Portland, OR for her annual women's retreat, and I will drive up to Michigan to visit good friends Krash and Karen, then over to Chelsea to see my sister and husband before returning Tuesday to pick TLE up at the Indianapolis Int'l Airport at 11 pm. After that it will be time to roll the wheels, and start staring into the "Jello" once again. Saturday, May 25th, we were back to our normal schedule of 5:45 am start time. 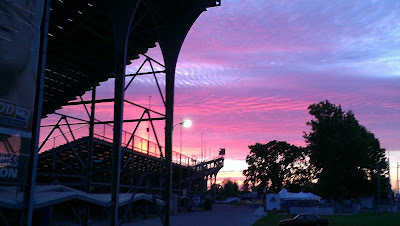 I am looking forward to May 27th when we really get back to our normal start time, which is being awakened by the sun. We have worked 15 consecutive days now......we have never done that in our entire lives.......not even at Amazon! On this 15th day of our workamper job we were slated to be excused from work at 3:15 pm, because our start time for our 16th day is 3:15 am!!! It became apparent early on that was more of a guideline, and not a rule. The reality was our 15th day was to be our longest workday....even longer than any day at Amazon.....13 hours. I clocked out at 6:35 pm.....my clock in time was 5:35 am! TLE did not clock out until just before 7 pm. What happened in between 5:35 am and 5:35 pm? Nothing overwhelming.......just a steady drumbeat of people and traffic for 13 hours. There were a number of events scheduled including an appearance by Parnelli Jones who spoke, and signed autographs. There was the running of 1950's era Indy Roadsters. There we probably a dozen of them who followed a pace car (2013 Chevy Camaro) around the 2.5 mile track, some hitting near 100 miles per hour in this exhibition.....pretty cool to see 60 year old Indy Cars running on the track for about 30 minutes. Most of the day saw us doing 1 hour shifts on the line, and one hour off. As the traffic let up we gradually shifted to 1/2 hour shifts on the line, and 1/2 hour off, but the traffic remained steady, and the pedestrian traffic was almost as heavy as Friday's crowd. Friday was also the day when many race fans came to pick up their "will call" tickets, so we spent a lot of time......I mean a lot of time.....explaining where the "will call" building was. The only reason we were excused from work was because the overnight shift had arrived. When we left at close to 6:30 there was still a lot of traffic....both pedestrian and vehicular. TLE was taken to Gate # 1 with Sarah to watch that gate the last hour, so we both arrived "home" at different times. We had dinner around 7:15 pm, and I was in bed by 8 pm. I sit here at the keyboard at 1:26 am.....we'll be leaving for the check in station at 2:55 am, and be on the job by 3:15 am.....all the gates open at 5:30 am, and it will be a jungle for about 6 hours until the race starts......this will be another 13 hour day, but we should be off by 4.....again, only a "guideline".....lol! Our marathon is just about over....this is the last time I will be up before the sun for a long, long, long time. It has been a good run, and the days have literally flown by.....we banked a little over $1,000 on Friday, and will bank a little over $1,300 this next Friday. Over the previous 13 days we have heard stories about CARB Day, and the day, itself, actually lived up to the hype of our co-workers. For whatever reason our start time was moved up 15 minutes from 5:45 to 5:30 am. We arrived at the check in area to clock in at exactly 5:15, but had to wait until 5:30 to get a ride down to Gate # 2 because the shuttle drivers were not scheduled to start "shuttling" until 5:45.......huh? I guess like any large organization with layers of bureaucracy, there is a lack of connecting dots from time to time.........like if you are have one large group of employees scheduled to be on duty at a specific time you must have a way of transporting them 1.5 miles to their work station so that they arrive at their actual start time, right? We can only clock in 15 minutes prior to our start time. Even if we clock in at exactly 15 minutes prior to our start time and took off walking immediately it takes at least 30 minutes to walk at a brisk pace to our station. Okay, that's my mini rant for today.....in the over scheme of things it's a small glitch, and no one was upset that we were 10 minutes late. One thing IMS Guest Services does do consistently is to have more people on duty than are needed at any time so we are never overwhelmed, but we usually have a lot of people standing around doing nothing. The day started out overcast, and quite chilly. 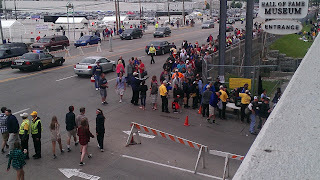 People started arriving before 7 am to enter the infield, however, the gates did not open until 8 am, so we were turning away cars by the hundreds. At 8 am sharp the sky fell......traffic on 16th Street was back up 3 lanes wide to the east as far as the eye could see, and that did not let up for 6 hours. My first shift on the line ran from 5:45 am to 7 am. When I came back on at 8 am I didn't leave my post until almost 12:30 pm.....same for TLE, and for all our co-workers. The amazing thing is it didn't seem like that long. As it began to let up we started taking short breaks to get water, eat something lasting about 15 minutes here and there. At last, around 3:30 people and cars began to stream out of the infield area, and, apparently they must have drained a small brewery because that is what the crowd smelled like as they walked, staggered, bobbed, and weaved out of the facility. By 4 pm traffic east and west on 16th Street was grid locked. I wish I had time to take a few pictures of the area from the same vantage point as the above pictures.......you could not have seen the street for all the cars and people. Public intoxication was the rule, not the exception. I am still stunned by what I witnessed. We were supposed to get off at 4, but were not dismissed until just after 6. We got our first pay checks on Friday when we clocked out, and arrived back home just before 7 pm. What a crazy, busy day........two days to go....Saturday should be a little less intense, but then comes Race Day when it will really get crazy here. Stay tuned! The main thing I will remember about Thursday, our 13th straight day of work, was how often the weather changed from sunny, to rainy within 30 minutes. It was hard to synchronize my apparel with the actual weather conditions at any given point I was on the line. I would go out for my 30 minute shift with a jacket, gloves, etc. on and the sun would come out. I would go out in short sleeves and sun glasses, and it would start raining. Thank goodness it never really rained that hard....more like a drizzle. The only constant throughout the day was it was cool, and the traffic was heavy. Traffic was heavy because Thursday was the "FREE" day......no admission fee unless you are going into the Museum. Thursday was also the practice day, and qualifying day all rolled into one for Indy Lights. Indy Light cars are a little smaller....not much smaller....and not as fast as the regular Indy cars. They top out at around 190 mph. This is like the triple A baseball league of Indy Car racing where young drivers get a chance to prove their worth. There was one driver who was just 18 years old, and slated to graduate from high school Saturday. The actual 100 mile, 40 lap Indy Lights race is Friday afternoon. We continued our 30 minutes on the line, and one hour off all day long. Initially our clock out time for Thursday was to have been 4 pm, but due to the intermittent rain they were not able to start Indy Lights qualifying until 4 pm, so we were there until 5:30. Friday is known as "CARB" day. CARB is short for carburetor, harkening back to the days of actual carburetors being used to feed fuel to the engine. This was the day the racers would spend adjusting their carburetors before the actual Race Day. According to all our co-workers this is the day everyone gets crazy here........a little too much drinking (by the customers....not the workers), but I'm sure that will depend on how cold it is Friday, and right now the weather guessers are predicting low to mid 60's and cloudy. Hard to believe there are only 3 days left on our assignment here. We have made some good friends, and have actually, most of the time, enjoyed our jobs, but we are really, really looking forward to being able to wake up to the sun again instead of walking to work in the dark. While we were at work Thursday TLE had some Chili slow cooking in the crock pot, and was it ever delicious. While we ate we watched Master Chef.....I know, how appropriate, huh? We have entered the 4th turn of our race, and are heading down the home stretch to the finish line. We're doing good physically and mentally, but are grateful we are about done with our "race". Wednesday is the traditional "Community Day" here at the Indianapolis Motor Speedway. 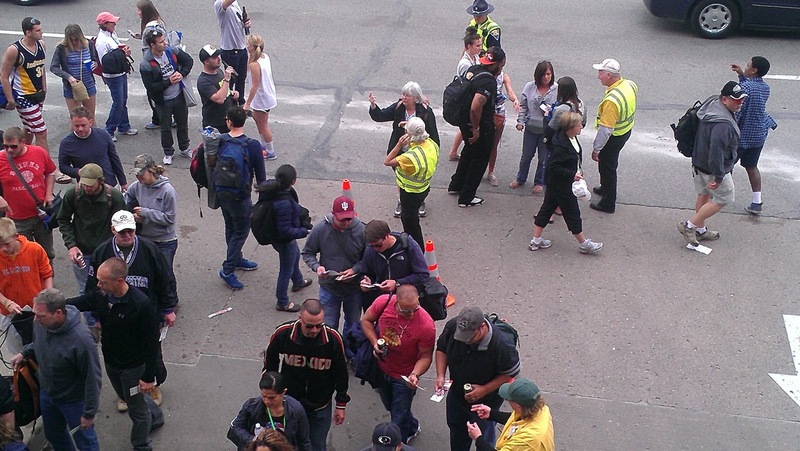 On this day IMS allows local charities to come in and collect ticket revenue at the gates. There were a number of activities going on, including the chance to drive your car on the track for $25. As you can imagine, there were a lot of takers. The traffic was not super heavy, but kept us busy all day long. The weather put somewhat of a damper on the day as the rain came and went. Most of the storms seem to come from the southwest, and being stationed at Gate # 2 on the south end of the track gives us a front row seat to approaching weather, so we have time to prepare for the rain, and/or lightning as it approaches. We were in and out of our rain gear all day long, and we had our jackets on a lot......the temperatures have cooled back into the 60's where they will remain through Race Day. Our co-workers tell us that last year the temperatures were in the 90's and 100's, so we are happy to have the rain and cooler weather this year. I can't imagine standing on the line in triple digit temperatures......it's tough enough in the high 80's! I snapped this picture of the "Pagoda" around 5:45 am on our way down to Gate # 2. It came out a little blurry. Here are a couple of file pictures that may do it more justice. It is quite beautiful when lit up at night. Since we did not need any ticket sellers Wednesday we only had traffic control personnel scheduled, but there were only four of us on duty, so we ran 30 minute shifts of two on the line all day long. 30 minutes on and 30 minutes off. Around 4:50 pm we we saw a large storm cell approaching, and it looked ugly......the clouds were stacking up thousands of feet into the sky. We were advised via two way radio that they were expecting high winds and were starting to evacuate the facility. We had left our awning up, and suddenly I'm seeing visions of a destroyed awning. I went to our supervisor and asked permission to leave immediately to go to the coach and put the awning in. It happened that another supervisor had just come up on a golf cart and he offered to wisk me up to Gate # 10. We were there in 5 minutes and I was sprinting across the grass field as the torrential rain began to fall, the wind was just starting to pick up. I quickly stowed the awning.....probably took 2 minutes, and I was drenched! Thankfully the high winds never materialized. TLE arrived home a little after 6 just as my wet clothes were finished drying. Nothing like a little excitement to bring your day to a close. TLE made Chicken Alfredo for dinner and it was scrumptious! We watched "So You Think You Can Dance" while we ate, and were in bed a little after 9 pm. Four days to go, and these will be the busiest days culminating in Race Day when 400,000 people will jam into the IMS for a few hours. Nada......that about sums up Tuesday. There were a few training sessions taking place so we were checking through many people headed to those sessions. There were a lot of trucks.....some very tall and long ones.....coming in for the "Indy Lights" race which is Friday. Since there was only a skeleton crew on duty we were able to drive our car over to Gate # 2 and park there, which made getting to and from work less complicated.....hard to get shuttles back to Gate # 10. By 8 am the rain came in torrential fashion, accompanied by lightning and thunder, so we retreated to the break tent until the rain subsided, and the electrical aspect of it had passed by. Within 2 hours the sun was out, and by Noon it was clear blue skies and much higher humidity due to the rain. TLE, Sarah and I continued our 1/2 hour on, 1 hour off rotation throughout the day, however, when large trucks come in we all spring into action to stop traffic and guide the driver into the tunnel. One driver failed to swing wide enough to enter the tunnel and had to back out when his trailer began to ride up on the high curb......that was interesting! Rick, our supervisor, decided to order Pizza Hut Pizza for lunch, so that was a nice treat....thank you Rick!! Sarah, who is just 20 years old, and going to college studying criminal justice, needs every dime she can earn, so TLE gave her the last 30 minute shift (5:30 to 6), and we headed home an hour early. An extra hour is so precious.....we used that hour to fill up our fresh water tank. We had just under 60 gallons, and probably could have made it to Sunday, but since we had the time we decided to just put 100 gallons back in and not worry about it until after Race Day. The black tank is doing good....just over 1/2 full with 5 days to go. After filling up the fresh water tank we had dinner, and then watched Revolution, and a recorded episode of CSI....then it was off to bed at 9 pm. Monday was a nice change from the previous four days where we had very heavy traffic at Gate # 2 each day. Monday had no events scheduled except the running of the 2 seat Indy Cars for those who have purchased the opportunity to ride a few laps at 185 mph. they call this the "Indy Experience". The cars used are exactly the same as the regular Indy cars with the addition of a second seat just behind the driver. At $500 per ride I was surprised how many people entered the Raceway Monday.....somewhere north of 150.....to partake in the "Indy Experience" ride. As each car bearing "Indy Experience" people approached I could tell before they even rolled down their window where they were headed.......every one of them had a smile from ear to ear. It was cool to see how many women were taking rides.....probably between 30 and 40% of the total. The ages of all the riders ranged from early 20's to early 70's. Only, TLE, myself and Sarah were on duty with our supervisor Rick. The three of us (TLE, myself and Sarah) took 30 minute shifts all day long with one hour off in between each shift. The weather was cloudy all day long....most of the time very heavy, which kept down the discomfort of the humidity. The temps edged up to 87 again, but with little direct sunlight it was tolerable. In between my 30 minutes on the line I read. Because there were no big events scheduled the employee staffing on Monday was "skeleton" in nature, and there were few employee shuttles were running at 5:40 am, so TLE, Sarah and I walked the 1.5 miles up to station 2 in the early morning 100% humidity......."yeah, that's the ticket". One thing that did keep us hopping was the number of large trucks coming in Monday. When the big transports arrive we all need to be in the street to stop traffic so the big rigs can swing wide to enter the tunnel. Elaine and I had decided Sunday afternoon that we would break our routine Monday and go out to dinner after work.....usually we go straight home, take a shower, eat dinner, rest a little and then go to bed. After a while that routine starts to feel a little claustrophobic....unlike Amazon where we had days off, we are working 16 straight days here. Our choice to break the monotony was to head back to Grindstone Charley's for a couple of brews, and dinner. I had their Charbroiled Salmon with a Caesar side salad. Once again the food here was delicious....definitely a Yelp "5". We got home from dinner around 8:30, and got to bed shortly thereafter. Tuesday will be much the same as Monday with a skeleton crew on duty, then back to the hordes on Wednesday. Only 6 days to go! Our time on the job is quickly coming to an end, although we will be here until at least June 6th. 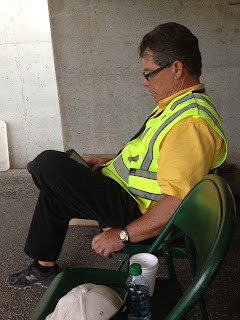 IMS - Day # 14 - Traffic Control - 9th Day & things that go "bump"
The time has flown by here at IMS......we have completed 14 days of residency here in the "workers campground".......funny....that sounds like a place to be found in the former USSR doesn't it? It has been warm the past few nights, and we have been running the front A/C most of the night. We usually do not like to have the A/C on at night while we are sleeping, but when you're tired you just want to be comfortable, and keep the inside air as dry as possible. Sunday we started our new schedule which sees us clocking in by 5:45 am each morning. We are now arising at 4 am to get ready for our day. The sky was mostly clear at dawn as "Bump Day" got under way. Bump Day is the day when the final 9 spots of the 33 car field are set. This happened before 1 pm, and the rest of the day other drivers attempted to top the speed of the 33rd driver (223.176 mph), but no one could "bump" Katharine Legge" 4 lap average the rest of the day. The temps got to around 87, or 88, which is not optimal for Indy Cars....the track just gets too hot, and slows the cars down. Our Sunday did not look much different than Friday, or Saturday.....traffic was heavy most of the day until after 3. We were mostly doing 30 minute rotations on the "line" due to the heat and humidity.....I snagged a couple of 20 minute naps, and read on my other breaks. We had a lot of help Sunday from the Indiana State Troopers when the traffic got particularly heavy, and we appreciated the extra help, especially when the traffic exiting the infield got heavy towards the end of the day. We had 3 inbound lanes going most of the day, but by 4 we were down to 2 inbound lanes with mostly just one lane seeing steady traffic, so we went to three 2 "man" rotations giving us one hour off for every 1/2 hour worked. TLE and Sarah worked the next to last shift from 5 to 5:30....I worked my last shift from 4:30 to 5. TLE and I then began the trek "home" just after 5:30 and were home before 6 pm turning on the A/C and shedding our sweaty clothes. Since we have each had to shower every day the past 5 days our hopes of making it to the end without dumping the gray tank again did not come to fruition. We do have 80 gallons of fresh water left, but the gray tank was about 7/8's full after 10 days, so after cold showers were taken we went out to pump the effluent from our gray tank. The black tank is only just 1/2 full, so we should make it to Sunday with no problem, but we may need to add some fresh water later this week....it will be close. When the daily temps were in the 50's and 60's it was easy to think we might make it. TLE was in bed by 9:15, but I was wide awake until 10:30.....guess those cat naps are doing the trick. IMS - Day # 13 - Traffic Control - 8th Day, aka: Pole Day! Saturday was Pole Day, or Qualifying Day at IMS. Our clock in time Saturday read 5 am on our schedule.......the alarm drove us from blissful slumber around 2:50 am....truly iniquitous as I wrote earlier. I cranked out Friday's blog entry whilst sipping a couple cups of coffee, then ate breakfast and started getting ready for another day on the traffic line. Saturday the gates opened to the general public at 6:30 am, but workers and other related traffic were already streaming through Gate # 2 when we were dropped off at 5 am to begin our day. It was, of course, still dark. By 9 am we had already been on the job 4 hours, and I needed a NAP as I took my 30 minute break.......suddenly TLE was waking me up....I had fallen asleep sitting in the folding chair. At 9 am began 60 minutes of practice laps by those contending for Pole Position.....I walked up the ramp around 9:30 on my next break to watch, and saw a 229.808 mph lap posted....that's about as close to 230 mph as you can get. Within another 30 minutes it started gently raining, and practice had to be stopped. 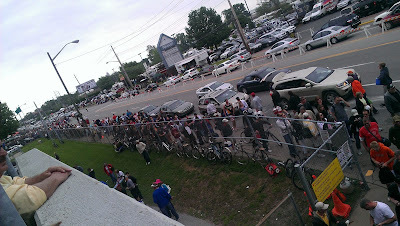 Even though it was raining traffic still continued to poor into the infield area of the IMS. By 2 pm the infield parking was full, and we had to start turning away traffic. 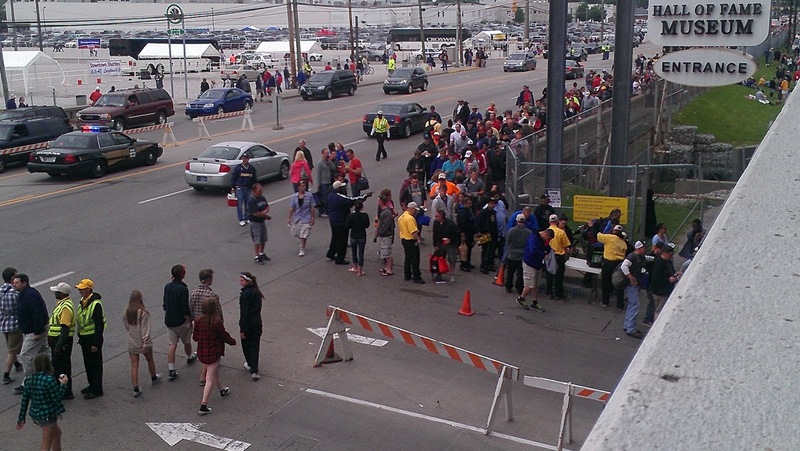 Only those with reserved parking, and, of course those working for race teams could enter for the rest of our shift. I think it was harder work turning away people, and explaining to them that the infield parking area was full. Of course, there are a number of parking lots all around the perimeter of the track. We continued our 30 minute shifts, and eventually the rain stopped, but left behind high humidity.....one of my favorite things. That coupled with the sun coming out again made for a sticky afternoon to be sure. TLE and I finished our last shift on the line at 5:30 and headed home for the evening. It was a very busy day, and our first 12.5 hour day, and we are both starting to feel the fatigue of 8 straight days......we are now half way through our 16 straight days of work. Starting Sunday our check in time is 5:45 am each day, and 3:15 am on Race Day...May 26th, and then we will be free once again. We both were in bed a little after 8 pm. I'm sure you are wondering...."who won the Pole? "......to answer that question in two words.....Ed Carpenter with a four lap average speed of 228.762. The Andretti team won the next 3 positions.....they have 5 drivers. Many days here have their own unique names earned over the 100 plus years of this event. Friday is known locally as "Fast Friday". It's the last day before "Pole Day"....aka: Qualifying Day......so all the teams are out in force pushing their cars to higher and higher speeds. In anticipation of "Fast Friday" one driver pushed it a little too hard into turn one, and put his car into the wall pretty hard......so now we have our first crash. "Fast Friday" started out, much like Thursday, with very heavy cloud cover, and as we walked to the check in area it was apparent, at least at that time, that we would get rained on Friday. We "clocked in" and caught the first golf car shuttle up to Gate # 2 where TLE and I found out there were just the two of us, plus Sarah, and then Rick (our supervisor) and Dan. By 8:30, just 30 minutes into my first break I was called back to the line.....we were getting slammed with inbound traffic. Thankfully, this day, the Indianapolis P.D. showed up to assist us. Without their help we would have sunk quickly. The inbound traffic never really let up the rest of the day, and on this day there must have been a 100 school buses entering IMS for the day. We were reduced to taking 10 minute breaks and then back into the line. TLE actually ran "point" several times Friday and did a great job, just as I knew she would. I was on a break around 3 pm when we started seeing lightning in the distance....within 15 minutes the sky fell......you could not see across the street and the wind was blowing the rain sideways. Everyone still on the line quickly retreated to the break tent, and there we remained. Finally about 3:45 the main office called on the two way radio releasing all the workers at every gate except for the supervisors. Well, that was all fine and good, but none of us were going to walk 1.5 miles back to Gate # 10 to clock out, so there we sat waiting out the deluge until almost 5 pm when they finally were able to bring up an enclosed passenger van to transport us to Gate # 10. Normally......whatever "normal" is on a job we have held for 7 days....we would just have stayed until quitting time, but Saturday we must clock in no later than 5 am, so getting off an hour early means we have an extra hour before we have to get to bed.....for TLE that means between 8 and 9 pm.....way, way to early for me. I fell asleep in my recliner around 9, and woke up at 10:15 and moved to the bed where we were rudely awakened this morning (Saturday) at 2:50 am........as TLE and I often remark when we must wake up way, way too early......."this is iniquitous!" Well, that was "Fast Friday", and it was faster in every sense of the word! Thanks for stopping by! I was re-reading my entry for Wednesday and realized that I neglected to mention it rained pretty hard Wednesday evening, and into Thursday morning, which included lightning and thunder. We awoke Thursday with the full expectation we would be working that day in the rain. Weather.com showed 60% chance of rain beginning early afternoon, and extending at that percentage into the evening. The interesting thing about Indianapolis is that the local weather guessers, when giving the day's guess, usually will refer to conditions north of I-70. and south of I-70......well, as it turned out Thursday that "guess" came to pass if you lived south of I-70, but for those of us who currently reside north of I-70, while very cloudy, it was dry all day long. The heavy cloud cover did keep the temperatures in the 70's, but the humidity stayed high most of the day resulting in personally damp conditions, if you know what I mean. Both TLE and I are starting to experience a little fatigue.....typically we get into bed between 9:30 and 10 pm, and I get up around 4:30 am, while TLE rises and shines at 5 am sharp. "Why" you might ask......okay I might as well get the truth out.....TLE needs a lot less time to get ready to go.....I need that much more time....I don't like having to rush around in the morning. It was the same when I had weekend soccer assignments....I would get up at least an hour earlier than I realistically should need.....I am a morning person, and I love that time of the morning, so why cut it short? To make a long story short, we are typically getting between 6, and 7 hours of sleep a night.......sometimes less..... but we have gotten used to getting 8-9 hours per night. We are doing 11 hour shifts, and starting Saturday we will be doing somewhere north of 12 hour shifts. The inbound traffic got heavier earlier on Thursday, and we had to open the 3rd inbound lane an hour earlier. Thankfully the traffic was not as heavy as it was Wednesday. From 10 am on we stayed on 30 minute rotations due to the warmish, high humidity conditions. Because all of us, including the race teams, thought the rain was coming early afternoon, there were a lot more cars out on the track starting at Noon than usual attempting to get as many practice laps in before the rain came as possible.....as it turned out it never did, and the practice laps climbed into the hundreds by mid afternoon. The result was the background noise level was significantly higher....a preview of Race Day, no doubt. The people who "watch" us on the numerous TV cameras which blanket this facility have let those of us working Gate # 2 know we are doing an excellent job, which coincides exactly with our personal opinion of our team's performance! The nice thing about this job, and I think I've mentioned this before, is the time does seem to go much faster, and we never seem to get bored. If you've been following our blog going back to our Amazon experience you will know that was the most difficult part of that job....BOREDOM. Those employees who run the various shuttles around the track area have gotten their act together, and we have had no trouble catching shuttles to and from work. We have found there is a time clock in a water proof metal box right at our Gate 10 destination at the end of each day where we can clock out as we exit the shuttle, and then it is a couple hundred yards walk "home". That was Thursday........Friday will mark 7 days on the job, and 9 to go. Friday is known as "Fast Friday"....it's the last day before Pole Day, Saturday.....that will be a very, very busy day. It's starting to feel a lot more like late Spring here in Indianapolis. For the first time we walked to work without our jackets and gloves on. There was that kind of feel to the air that told you it was going to be a warm day.....certainly not triple digits, but warmer than we've been used to for the past 7 weeks. It's funny how your body gets used to cold weather, but that first warm day....mid to high 80's feels a lot warmer than it really is. I know by the time we finish with our assignment here at the INDY 500 these days will, in retrospect, seem cool. No doubt there are triple digit days coming in the future.....not necessarily here in Indianapolis, but eventually. I heard a report on the Weather channel yesterday that it was over 100 in Sioux Falls, SD two days ago.....that's where we are headed after we depart Indianapolis....so it's looming out there.....hot weather. The question, I guess, is will we be able to dodge the triple digits as well as we did last year? The morning went as it usually has.....around 7:45 am all the workers start streaming into Gate # 2, and it's just one continuous line of cars for about 15-20 minutes, then it lets up until 10 am when the gates are open for the general public to enter, then we go to two entry lanes, but it's manageable. At around 11:15 Wednesday the flood gates opened. Suddenly we had two lanes of street traffic stretching out as far as the eye could see wanting to turn into Gate # 2. We tried to handle the flow with two lanes, but finally had to open a 3rd entry lane. Suddenly we everyone on traffic control was in the street.....all six of us, directing traffic....no one was expecting this kind of traffic on Wednesday. Then, at exactly 1 pm, as quickly as it began, the traffic eased up and we were back to 2 entry lanes. TLE and I are told that on Race Day, May 26th, it will be like that for about 5-6 hours straight. We are both settling into our responsibilities nicely......the one difficult thing for us to learn is to differentiate between the myriad types of credentials, "hard cards", badges, car stickers, tickets, etc. I think after 5 days now I've got a better handle on that part of the job, too. Those who have been doing this for 20+ years say it used to be much simpler....sometimes change and/or progress do not result in the desired efficiences.....I'll let it go at that. Because it got much hotter yesterday, and then add in the fact we are standing on asphalt, which is increasing the temperature by a number of degrees, our shifts were shortened to 30 minutes from 60 minutes, and our supervisors were walking ice cold bottles of water out to us to keep us hydrated. The one big difference between this workamping job and the Amazon job is that the time really seems to pass much more quickly, and it is not as hard on our feet. Thursday will mark our 6th day on the job, and that will mean we only have 9 days to go. The heat of the day seemed to stifle our appetites, so we just ate a few snacks for dinner, and watched our two recorded Tuesday shows....NCIS, and NCIS L.A.....then headed off to dream land. Oh, by the way......we had the A/C on from the time we got home until just after midnight....haven't had to do that for a long time! If you are stopping by today to see what happened Tuesday, Day 8, just refer to Monday, Day 7. I'll just recap those things that were different.....it was 15 degrees hotter, and the traffic was heavier. Some days are just hard, at 5 am, to write about in a way that makes them more interesting than they were, and I guess that is the way many, if not most jobs are. After the newness wears off, and the anxiety about getting through that new job learning curve dissolves it's just work. What makes it interesting, for me, is the people. The people we work come from every vocation under the sun. What they all have in common is a love for the "Indy" experience. Some are in their 70's, and some, like our co-worker Sarah, are in their early 20's. Sarah stays in a large tent here in the campground. Many of our co-workers have been working the "500" for over 20 years.....some close to 40 years. Our overall supervisor, Linus Rude, has been here since he was 15, and is in his 31st year. Linus is not retired......he does have a real job. My traffic control buddy, Joe, is a retired middle school teacher, a history buff, and an avid reader. When we are out on the line directing traffic he will talk about the history of the traffic during lulls in the traffic. Another co-worker, Greg, is a Marine (served one 3 year stretch), and now works for "Head Start" Mon-Fri, and arrives at the track around 2 to work the last 4 hours of the shift. On the weekends he works the full shift. When we are out on the "line" we each take turns running "point"....the point guy determines what lane each vehicle will enter.....the "point" directs traffic into lane 1 until it is full, then directs vehicles to lane #2. He also determines which vehicles may not enter through Gate #2 from 10 am to 6 pm. The second person backs up the point. All buses, trucks of all kinds, motorhomes, and limos go in lane 1. Motorcycles are directed to lane 2. Each lane takes you into a tunnel that goes under the stands and race track. Gate #2, where we are stationed, is the only one that can accommodate vehicles over 8' tall.....our gate is 13'11", but the ceiling was not always that high. Even so, some of the large transports have only a few inches clearance as they creep through the tunnel, and they have to be sure they are far enough to the left as they enter the tunnel, or the trailer will hit the curb, and bounce the rear of the trailer up into the ceiling. We also have a lot of pedestrian traffic that enters on each side of Gate #2. There is no parking fee for the vehicle, but each person is charged $10......as we get closer to the race, and the traffic increases the rate goes up in increments of $5.....right now we are still charging $10 person. The "infield" of the track is enormous.....a small city could exist there....actually, it is a small city, which also includes 4 of the 18 holes for the Brickyard Gold Course. Each day as we are shuttled down the middle of the infield we pass the motor coach area where all the drivers have their million dollar plus coaches......I would say about half are Newells. Another parking area holds all the enormous transport trucks. There are restaurants, concert venues, office buildings, etc. I am told that on race day over 400,000 people fill the viewing areas......remarkably "we" are able to empty the track after the race in about 90 minutes. Our shifts start, right now, at 6;45 am, and end at 6 pm. Saturday our start time will be 5 am, and will end at 6 pm. Then, starting Sunday, our daily shift will begin at 5:45 am, and end at 6 pm. Race Day our shift starts at 3;15 am, and ends at 4;15 pm, or shortly thereafter. Amazingly, in just 4 days my body has adapted to waking up at 4:30, and I am getting by on 6-7 hours of sleep....thank goodness for 5 Hour Energy! Okay, well I guess the preceding was a decent attempt at making the same thing sound a little more interesting......at least I hope it will be received as such. Oh, I almost forgot, a few months ago one of my blog readers, Jeanne, wrote asking if when we were in Indianapolis, could they come and meet us....they live in the area, so we set the date for Tuesday at 7 pm. Chris, her husband, works for one of the Indy Car race teams. 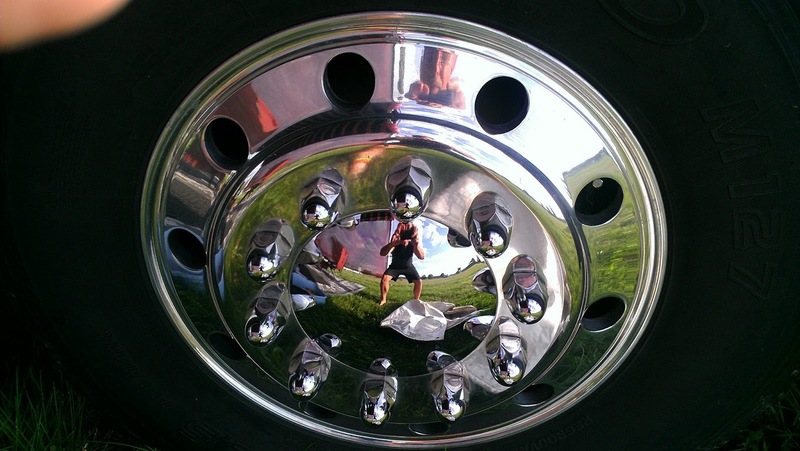 They, just a few months ago, purchased a 1989 Prevost, 40', motorcoach. The conversion was done by Marathon. They just started fulltiming in March, after selling their local home. They are in their early 50's, and Chris plans to work while on the road. They brought some nice craft beer with them as a gift, and we sat talking for an hour and a half...Chris has to be at the track each day early, just like us so they bid adieu around 8:30. We are so glad we had the chance to meet them, and are looking forward to seeing their coach after Race Day. That was our 4th day......time to eat breakfast, and head out for another work day....it is 5:56 am as I finish writing. Monday felt more like a Wednesday to me......for some reason my internal day clock is all messed up. The morning air temperature was a little higher....in the low 40's as we left to walk to the employee check in area, but it warmed up to close to 80 by mid afternoon. After clocking in at the employee check in area around 6:30 am we were able to find an employee shuttle almost immediately, and were quickly transported south to Gate # 2. We both started out wearing our IMS issued jackets, but within a few hours I was down to my short sleeves and enjoying the pleasant air. Here I am in position waiting for some cars to direct! The incoming traffic ebbs and flows....most of the time we have two entry lanes going full blast, but this was taken during one of the "ebbs". TLE awaiting traffic to direct! I took this picture of TLE from across 16th street....this is where all the action is. Today a late model Newell came in.....wasn't able to get my camera into action quickly enough to get a picture. We worked until 6 again, and were able to catch another employee shuttle back to Gate 10 where we clocked out for the day. We then walked over to employee check in to get two clean shirts and turn in our soiled ones. We were home by 6:30 stripping off our work duds, and settling into relax for a few hours before we went to bed, and get ready to do it all over again. 13 days to go....but we are not really counting down like we did at Amazon. We are really enjoying ourselves a lot, and the days seem to fly by. Tuesday the forecast is for 83 degrees.....that is a big temperature swing, and I'll probably be wishing at some point I could change into shorts and flip flops, but it is what it is. Sunday started cold, and stayed cold. TLE and I both had "under armor" on the entire day, plus our IMS parkas, as the high only reached 53, however, the sun was out the entire day, which helped, somewhat, to offset the cold. Everyone I have talked with says it was 30-40 degrees warmer this time last year. Of course, this also causes a problem for the race teams. They can run practice laps, but until the track surface warms up enough they cannot really open up their cars and run max speeds, although I did see a few cars hit 218+ mph when I went up on the ramp to watch during one of my breaks. Our routine each day will be pretty much the same, except starting this Saturday our clock in time is 5 am....Saturday is "Poll Day', and the gates open at 6:30 am! After that we clock in each day at 5:45 am, then on Race Day, May 26th we clock in at 3:15 am! Okay, well we have 14 days to go on our IMS marathon. Don't get me wrong, this is nothing like Amazon.com in the sense that we are not walking and standing for 10-12 hours straight. Every other hour we can sit down, eat a snack and relax. I'm sure you can appreciate how much easier on the feet and legs that is. Our overall supervisor, Linus Rude, has taken a liking to TLE.....well, who wouldn't, right? He occasionally wisks her off to the Administration building to give another lady a lunch break, or just one gate down to spell another lady. She is liking the variety. We didn't get any pictures today, but I did upload a video to Facebook of a couple of cars running practice laps. Monday's blog entry will definitely have pictures of our work area. We worked the full shift Sunday right up until 6 pm, and ended up walking a mile plus home as it would have taken too long to catch a shuttle. We still haven't quite figured out the shuttle routine yet, and I think the drivers are still in a learning curve because they do not seem to run on a schedule you can count on yet. We arrived "home" around 6:30 pm, and while TLE took a shower I turned on the TPC gold tournament to see if my boy Tiger was doing well, and he was at 13 under par tied with Sergio Garcia. Tiger had just finished the 17th hole, and Sergio was just teeing off at 17. 17 is an island par 3.....you must carry the entire distance to the green over water. Sergio's first shot landed in the water, and so did his second....he went from being tied with Tiger to losing 4 strokes to par on one hole, and then hit the water on 18 carding a double bogey on the final hole, so he lost 6 strokes to par in the last two holes. At any rate, Tiger won his 4th tournament of the year. TLE went to bed at 9, and I was not far behind at 9:15.....I think being in the sun most of the day took a little more out of us than the first day. The forecast for Monday is slightly warmer with a projected high of 60.......here it is May 12th and we're happy if it hits 60. One of my co-workers asked if I would rather have it in the 90's.....no, I would rather have it cold......well, honestly, I would rather it was 70 degrees, and I could wear a t-shirt, shorts and flip flops, but I also wish rainwater were beer, and it's not! IMS - Day # 5 - Last day before.......WORK!